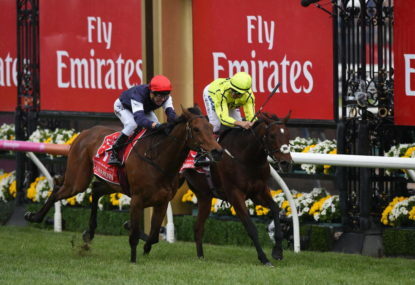 Rekindling has won the 2017 Melbourne Cup ahead of Johannes Vermeer and Max Dynamite in a thrilling finish by half a length. The 2017 Melbourne Cup is here, with a 23-horse field lining up for the biggest moment in Australian racing. Catch all the live coverage of the race, complete with updates, results and highlights with our live blog on The Roar from 3pm (AEDT). There are just five runners from last year’s big race to line up in the barriers again in 2017 for the 157th running of the race that stops the nation. Who Shot Thebarman is a late scratching from the race leaving the field down to 23 runners both international and homegrown. The world’s richest handicap race will, of course, be run at Flemington Racecourse over 3,200 metres. Pre-race favourite Marmelo has caught the attention of the bookies leading into the race, with the European horse running a strong sixth place in the Caulfield Cup two weeks back. The five-year-old cruised home with a blistering finish in the final hundred metres, gaining that key experience of a lead-up run on Australian soil that has hurt the chances of many international runners in the past. He’s had seven place finishes from his last nine starts in France, including three wins, the pinnacle being the Prix Kergorlay over 3000 metres. There’s plenty to like about the Hughie Morrison-trained horse with veteran jockey Hugh Bowman in the saddle and a barrier draw out at 16 that could be better, but certainly could be a lot worse. Not far behind is the reigning champ Almandin, who snuck home in an absolute thriller last year over Heartbreak City by barely half a nose. The German eight-year-old doesn’t have youth on his side, but he’s a powerful runner and continues to prove time and time again he has the legs to keep his career on track. He’s ridden just three times since last year’s triumph, but at this age, it’s about quality, not quantity. An impressive win by nearly three lengths at the JRA Trophy back in September was the perfect lead-up but there were some concerning signs in his last start at the Bart Cummins. Having romped home in the same race last year leading into the Cup, Almandin was expected to do the same again this year as the ideal lead-up run, but a disappointing and sluggish fourth-placed finish has pushed him from pre-race favourite back into the mix in a tight field. Humidor is an interesting prospect leading into the race, coming off an agonisingly close loss to Winx in the Cox Plate two weekends ago. The gelding has never run beyond 2,400 metres, so the two-mile dash of the Melbourne Cup will certainly be a learning curve for the five-year-old. An interesting campaign thus far has a Makybe Diva Stakes win and strong place finishes in the Turnbull Stakes and Cox Plate, as well as a fifth-place run at the Caulfield Cup. He’s drawn well enough in barrier 13 and it will be a case of taking the right pace for as long as possible and retaining as much of that explosive sprint pace as possible for the final stretch. Irish bay Johannes Vermeer has had two lead-up runs, both at Caulfield, and shapes up as a very strong chance to sneak a Cup win. Second in the Ladbrokes Stakes and third in the aforementioned Caulfield Cup have shown his worth at a steady distance, but, much like Humidor, he has never run at this kind of distance before. Another Irish runner, Wall of Fire, has also found success with a strong place finish in his lead-up run at the Herbert Power Stakes and is much more accustomed to the distance than his countryman Johannes Vermeer, although a lack of comprehensive runs in Europe leaves a bit to be desired from the international contender. Rekindling is proving to be a bit of a mystery item in the field, with the four-year-old bay bringing inexperience and some strong performances to Australia. Without a lead-up run and never having taken on two miles, he could be a dangerous chance at a top finish but also might fall apart in unknown conditions. Tiberian, Max Dynamite, Boom Time, Nakeeta and Cismontane are all coming in off the back of last start wins, to varying degrees of success. The one that stands out in that bunch is Boom Time, who bagged the famed Caulfield Cup two weeks ago and will be aiming to be the first horse since Ethereal in 2001 to do the double. This is one tough field to pick. There aren’t any real standouts, and while that may sound like it’s a field of average runners, it’s quite the opposite. There are so many strong stayers and contenders up front that you could almost point at a board in the dark and take any number of six or seven contenders. It might be a cop-out to go with the favourites, but they’re in that position for a reason, and it’s Marmelo and Almandin who are looking the goods to lead the way at the post. Last year’s winner Almandin may be ageing but he’s got a few tricks up his sleeve (shoe?) and has early spring form to work off despite the less-than-ideal result coming out of the Bart Cummins. Marmelo will be hard to stop especially with these two coming out of the barriers right next to each other. If he can slot in nicely along the rail on the first lap the rest of the field may be in trouble once he breaks out into some galloping room at the backend of the run. Boom Time is looking for the Cup double but it’s looking as likely as me running on the track and winning myself to take this one out in among a strong field. Look for Johannes Vermeer and Humidor to duke it out for the place finishes and Wall Of Fire, who impressed last start, to really challenge the lead in the final hundred. Hartnell wouldn’t be a bad bet if you’re looking to fill out the first four, but don’t expect any victory dance from that camp come races end. If you have a few spare coins in the back pocket, the two runners at the longest odds currently are Bondi Beach and Gallante. Catch all the live race updates, results and action on The Roar from 3pm (AEDT).